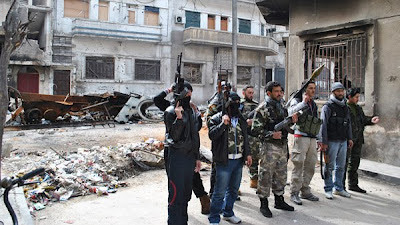 The Syrian Uprising: Part III, "Prospects for Opposition Victory"
Today we continue the third installment of our four-part series on Syria: Prospects for Opposition Victory. First, let's define victory for the opposition. Most importantly, they want Assad gone. Assad is unlikely to step down in any meaningful way without being toppled completely. If we look to Egypt and Yemen, both have changed figureheads, but the regimes have essentially stayed intact (Egypt remains ruled by the Army; Saleh's VP was the only candidate for president in Yemen, and his sons still hold hihg posts in the military). So victory will mean toppling the regime, and ousting a number of powerful individuals who benefit greatly from staying in power. After that, "victory" gets complicated. The Syrian opposition wants to build a constitutional democracy, and this likely means ousting the current military regime, which (like in Egypt) is different from Assad in the sense that it is loyal to itself and will not roll over if Assad is to go. Great. To actually have that monopoly, the Free Sryian Army (FSA) will need to remain a united force that decisively establishes itself as the monopoly on violent power in the country. In Libya, the NTC military forces have split up into various regional militias that are struggling with each other for power. This stage, "winning the peace," will be harder. As for the war itself: Syria is not fighting an effective counter-insurgency war. The US learned (the hard way) in long slogs in Afghanistan & Iraq that armed opposition groups must be won over and included in the political process. Paritcularly, it is clear that army defectors and even civilian instigators will be killed if caught, and this means that now, many people's lives fundamentally depend on opposition victory--and these people will fight until the end, unless there is a credible move to provide some reconciliation or amnesty, and Assad likely no longer has that credibility. What Egypt and Yemen learned is that disposing of the "face" of the old regime can be an extremely effective move in (at least temporarily) quelling unrest. Syria is practicing neither of these, and will likely be unable to simply crush the opposition into cooperation. The way things are going, it looks like the Assad regime has less than even odds of weathering the uprising and sanctions. The biggest risk to the regime, right now, is that its foreign currency reserves are starting to deplete. It's spending its money at a faster rate than it can funnel in through Iran and other allied sources. Sanctions often don't work, but Syria is facing these sanctions with a very small set of allies helping them, as well as an active war that is draining its treasury. The end-game for the regime, if it comes, would be a high-level defection of some sort--someone with military influence that loses confidence that the path to their personal prosperity is with the Assad regime (or, heaven forbid, has a change of conscience about the shelling of civilians). I'm not sure how likely this is, but again--I'd give it greater than 50%, due to the strength of the sanctions, the persistence of the opposition movement (and their incentive for their lives to continue to persist), and the seeming volume of military defection. The last of which means not only that the opposition will have the guns to continue fighting (and are almost certainly being supplied by allies in Turkey, and possibly the CIA/Mossad/etc) and that the military leaders will be faced with the fact that continuing to kill civilians will sow greater dissent among the ranks. This high-level defection would bring with it either a straight coup or a more protracted fight. A coup is more likely--Assad will certianly have military leadership doubting him enough that they could want to be at the front edge of a seemingly inevitable new regime, rather than the villain of it. That said, this coup may well have outcomes similar to those in Egypt, in which power is not wrested from the military regime. The military will _not_ lead a coup only to then throw itself from power. Such a coup would bring reforms, for sure, but many of the opposition would be disappointed. On the other hand, taking down the military regime completely would require a Libya-style sustained insurgency. This is also possible, given in particular a safe base of operations in Turkey, but would absolutely require foreign support in the form of training, serious armaments, and (likely) air support. We'll talk next time about the likelihood of such support. So, in short: Assad himself is likely not long for his current chains of office. How we define "victory," though, will color our interpretation of the most likely current outcome, which is the military removing Mr. Assad from office.